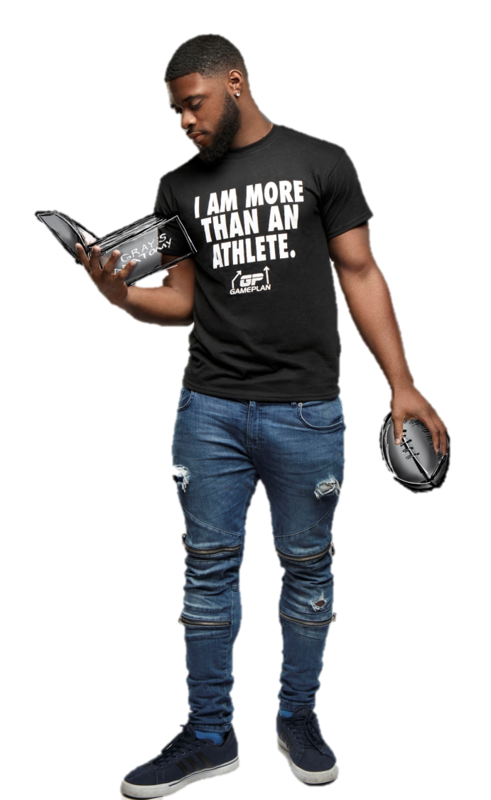 Help support our 1st Place Programs by purchasing the "I Am More Than An Athlete" T-Shirt. Game Plan, Inc., a registered 501 (c)(3), is a comprehensive youth development program aimed at assisting students from under-served communities with strategies to win in life. Through the Project Management Program, Game Plan Champions gain the necessary skills and experience to manage projects. Students first go through a project management course to learn the basics of project management. After completing the course, students gain experience by working on a real-life project with a local organization. Game Plan works with each partner school’s athletic department to provide programming for its student athletes during the off season of their respective sports. This allows the students to gain valuable work experience and prepare them for life after sports. Student athletes also learn the requirements to becoming collegiate student athletes. Game Plan Champions are introduced to many different careers through guest speakers discussing their work. Students learn the requirements along with the roles and responsibilities for different occupation options. Students also complete assessments to determine what professions might fit them best. Students who have completed a year of the program are eligible to obtain internships with partner organizations, as well. In the Entrepreneurship program, Game Plan Champions first gain foundational knowledge of entrepreneurship. After successfully completing an elevator pitch to a group of judges, students officially form their start-up companies. HELP OUR STUDENTS WIN IN LIFE.